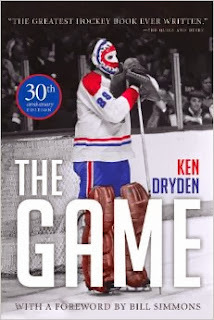 It’s hard to believe, but we’re already at the 30th anniversary edition of Ken Dryden’s The Game . Widely acknowledged as the best hockey book ever written and lauded by Sports Illustrated as one of the Top 10 Sports Books of All Time, The Game is a reflective and thought-provoking look at a life in hockey. Ken Dryden, the former Montreal Canadiens goalie and former president of the Toronto Maple Leafs, captures the essence of the sport and what it means to all hockey fans. He gives vivid and affectionate portraits of the characters—Guy Lafleur, Larry Robinson, Guy Lapointe, Serge Savard, and coach Scotty Bowman among them—who made the Canadiens of the 1970s one of the greatest hockey teams in history. But beyond that, Dryden reflects on life on the road, in the spotlight, and on the ice, offering a rare inside look at the game of hockey and an incredible personal memoir. Take a journey to the heart and soul of the game with this timeless hockey classic. It may have been thirty years since this seminal book first hit book stores, yet it’s still just as relevant as ever. This commemorative edition marks the 30th anniversary of the book’s original publication, and it includes a new foreword by Bill Simmons, new photography, and a new chapter, “The Game Goes On.” The new chapter discusses the tradition of NHL players from the Stanley Cup-winning team having the opportunity to take the Cup home. Surprisingly, this tradition didn’t start until 1995. Having never had the chance to take part in this custom, Ken petitioned to have the opportunity to do so, and when his request was finally granted – he celebrated his success in a big way. As the quest for the Cup is just beginning for the year, The Game: 30th Anniversary Edition is a shining example of how much hockey, our national sport, has changed, and stayed the same. What a great time to introduce this award-winning book to a new generation of players and fans.